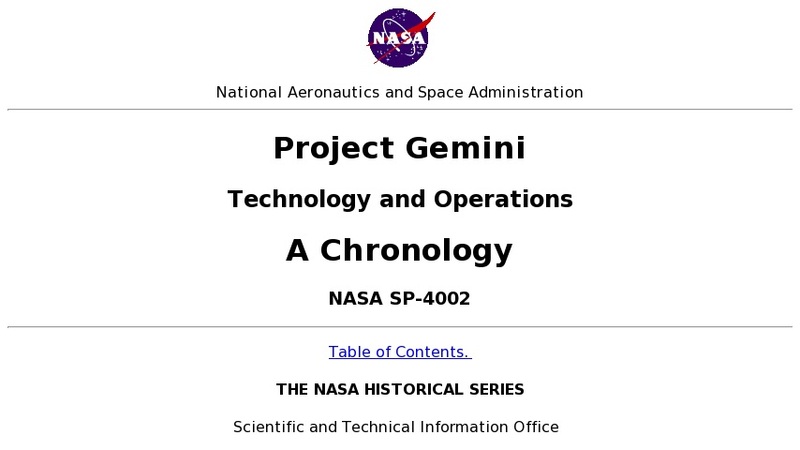 This internet version of an historical NASA (National Aeronautics and Space Administration) publication contains information about Project Gemini, which laid the groundwork for the Apollo missions. The history of this project is told in three parts. Part I, Concept and Design, discusses the formal initiation of Project Gemini (first designated the Mercury Mark II project). Part II, Chronology, Development and Qualification, spans the years 1963 and 1964 when the main task became translating Gemini designs into working machinery reliable enough for manned space flight. Part III, Flight Tests, chronicles the events of 1965 and 1966, dominated by the 10 manned missions which constitute the main part of the Gemini program. To round out this volume, there are several appendices which summarize, tabulate, and make easily accessible some major aspects of Project Gemini.